If you’ve experienced a broken tooth or decay that encompasses a lot of your tooth, it doesn’t necessarily mean that it needs to be extracted. At Salvaggio Dentistry, we believe in saving a natural tooth whenever possible. But because of the circumstances, sometimes the crown, or top of your tooth, needs some extra support. That’s where a dental crown comes in. Why Choose Salvaggio Dentistry for Dental Crowns? 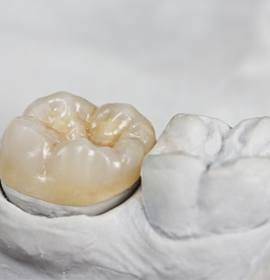 Sometimes called a cap, a dental crown is a porcelain dental prosthetic that is placed on top of your natural tooth. It replaces lost or damaged tooth structure above the surfaces of the gums and helps you get your tooth’s full function and health back. 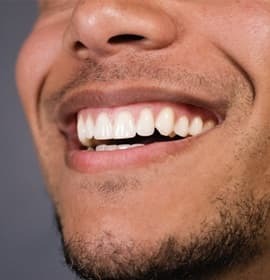 In addition, with advances in materials and technology, dental crowns are now crafted to look exactly like real teeth. It helps prevent additional decay. It strengthens your natural tooth structure. It improves the appearance of your broken or decayed tooth. It can correct an oddly shaped or discolored tooth. It can replace silver crowns. It is made of durable material that is also stain resistant. One of our dentists will clean out any decay and remove a portion of your tooth to make space for the crown. Then, we will take impressions of your teeth, which will be sent to a dental lab that specializes in producing prosthetic teeth. We will place a temporary dental crown while your permanent, custom-made one is being created. When the final product is finished, you’ll return to our office so that your crown can be bonded to your tooth. In just two appointments, your tooth can look, feel, and function just as it did before. Brushing your teeth two times a day. Flossing your teeth once every day. Visiting the dentist for checkups and cleanings twice a year. 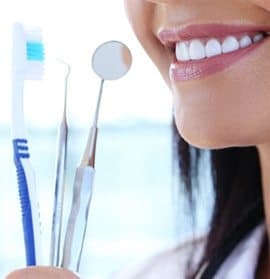 Our team of compassionate, highly trained dental professionals are committed to repairing and restoring your teeth so that you can keep your happy, healthy smile for many years. Contact us today for an appointment!